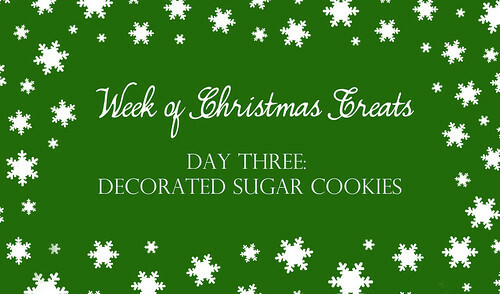 Day Three of a Week of Christmas Treats, and today’s recipe has been a long time coming. I feel a little guilty that I haven’t yet shared this recipe. But better late than never! I’ve been making this particular cookie recipe for 2 years now. The dough rolls out like a dream. The baked cookie holds it’s shape without sacrificing flavor or texture. And It’s the perfect canvas for both beautiful royal icing and tasty buttercream. It’s the same recipe I use when throwing a cookie decorating party and every year for Christmas. In fact, I’ll be tagging this recipe as a Baking Basic, because I think everyone needs a great sugar cookie recipe under their belt. In a medium bowl, whisk together the flour and baking powder. In a liquid measuring cup, use a fork to mix together the egg and extracts. Set both aside. In the bowl of a standing mixer, cream together the butter, salt, sugar, and lemon zest (if using). Add the egg mixture and beat to combine. Gradually add the flour and mix just until combined. Lightly knead the dough in your hands then, divide the dough into 2, roll into balls, then press into a 1-inch thick disc. Wrap each disc in plastic wrap and refrigerate for at least 2 hours, or up to 24 hours. While the dough is chilling, line baking sheets with parchment paper or silpat and preheat the oven to 375 degrees F.
After chilling, place a disc of dough on a lightly floured surface (a pastry mat or sheet of parchment paper dusted with flour is perfect) and roll, using a lightly floured rolling pin, to 1/4-inch thick. (If the dough is too difficult to roll, let it sit covered for 20-30 minutes to come closer to room temperature). 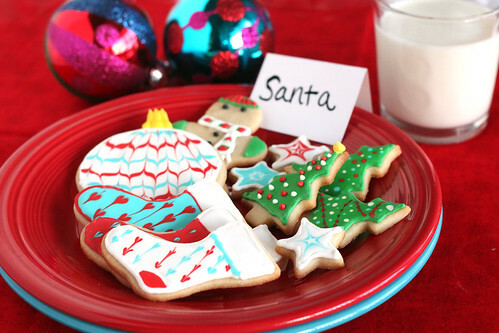 Use cookie cutters to cut dough into shapes. Combine and re-roll scraps as needed. Use as little flour as necessary for each step. 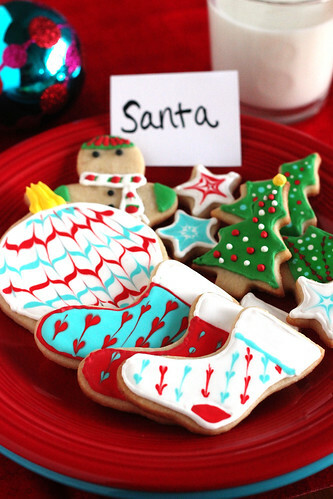 Place cut out cookies 2-inches apart on prepared baking sheets. Bake for 5-7 minutes, or until the tops no longer look wet and the cookies look slightly puffed. Careful not to over-cook, you don’t really want the edges to be brown. Allow to cool on baking sheet for a few minutes before transferring to a wire rack to coll completely. For decorating I used Sugarbelle’s royal icing recipe. I allowed the cookies to rest over night (I feel like decorating the same day leads to a funky royal icing texture/look) and then piped the outlines (with a pastry bag and small round tip) and let it dry for an hour or so. Once the outline was dry, I flooded the cookie with the desired color (using squeeze bottles). To make a the heart and swirl effects, while the flooded icing was still wet, I dropped small drops of a different color and then used a toothpick to drag through the dot. One day I’ll slow down and take pictures of my own process, but in the meantime there are lots of other super helpful tutorials. To add to the fun I invited the girls I used to nanny over for cookie decorating fun. This was, I think, the third time I’ve decorated cookies with them, so by now they are pros. And we’re back! My kitchen is unpacked, the cabinets are stocked, and the oven has been fired up! It feels good to get back to baking and the timing worked out perfectly for Jesse’s arrival back to the States and a pretty important birthday. Two weeks ago Jesse said goodbye to his 20’s and hello to his 30’s. Unfortunately, I was in the US and he was still in China. Since I didn’t get to make him a cake on his actual birthday, I knew I would I have to have one waiting for him upon his arrival in San Diego. I usually try and make him a fun over-the-top cake (including last years Cookies and Cream Oreo Cake) but this year with everything going on, I just couldn’t get together any over-the-top ideas. So I decided to go basic and classic. It works out perfectly for me because I’ve been meaning to add a Classic Yellow Cake to my Baking Basics series. 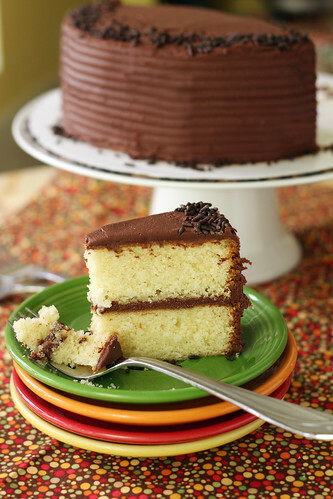 Everyone needs a good yellow cake recipe under their belt, and I this is mine. I love, love, love this recipe. The recipe doesn’t call for extra steps, such as folding in egg whites or using extra egg yolks, so it comes together pretty quickly. And the result is a buttery sweet cake with a soft, tender crumb that is still dense enough to work as a layer cake. Preheat oven to 350 degrees. Adjust rack to lower-middle position. Prepare 2 8 or 9-inch cake pans by greasing pans, fitting bottoms with parchments paper, greasing parchment paper, and flouring pans. In a liquid measuring cup, beat the eggs, milk, and vanilla until combine. Divide mixture by pouring all but 1 cup into a separate glass bowl or liquid measuring cup. Set aside. In a large mixing bowl (or standing mixer fitted with a paddle attachment), combine the flour, sugar, baking powder, and salt. With the mixer on low speed*, add butter one piece at a time and mix until the flour beings to look like wet sand and butter chunks are no bigger than a pea. Increase speed to medium and beat for 30 to 40 seconds after the all the butter is added. Pour in 1 cup of the egg mixture and mix on low speed until combined, then increase the speed to medium-high and beat for 1 minute. Scrape down sides of the bowl then add the remaining egg mixture. Mix on medium to medium-high speed for about 30 seconds. Scrape down sides of the bowl again and then beat for another 15 seconds. (It’s OK if the batter looks slightly curdled). Divide batter evenly between prepared cake pans and smooth top with a rubber spatula. Bake for 20-25 minutes or until a toothpick inserted in the middle comes out clean. Cool for 10 minutes then carefully flip out on to a wire rack (use a knife to loosen edges of the cake if necessary). Cool cake completely before frosting. *If you do not have a standing mixer, use a pastry blender to combine the butter and flour mixture. Then use a hand mixer to combine the liquid ingredients. In a medium bowl combine the melted butter and cocoa powder and stir until smooth. With the mixer on low speed, add the powdered sugar in small increments, alternating with splashes of milk. Once all of the powdered sugar has been incorporated, add the vanilla and beat on medium-high speed for about a minute, scraping down the sides of the bowl as necessary. If frosting is too soft, add a little more powdered sugar. If frosting is too stiff, add a little more milk (a teaspoon at a time). *This amount made *just enough* to frost and fill a 2 layer 8-inch cake. If you like more frosting, you can increase the recipe by 1 1/2 or even double it. Hello from China and happy Valentines day! Well after months of anticipation and weeks of hard work, packing, moving, and flying, I have finally arrived in Suzhou. So now what? It’s a bit strange because I have pretty much always been a busy person. Much of my adult life has been spent working a full-time job and teaching dance part-time or working a full-time job, a part-time job and teaching dance part-time or going to school full-time, working part-time and teaching part-time or packing/moving and working part-time/full-time. See the pattern? Busy girl. So this abundance of free-time feels a little funny. Of course I can’t sit still for too long so I am working on filling my time back up. I’m in the process of enrolling in a online BSN program, I also want to start taking classes to learn some Mandarin, and we will be looking for an apartment soon. We went out the other night and found a great grocery store, so once we get in an apartment I can hopefully get back on the cooking and blogging bandwagon. In the meantime I will appreciate the time I have and just be thankful that I am able to take it. I definitely understand how lucky/blessed I am right now. On the topic of keeping myself busy, in the weeks leading up to the move I did my best to build up a collection of photos and recipes. I also told you that I wanted to share some great baking basics, that might not be the fanciest of techniques, but were great jumping off points and good for when you’re in a pinch and need a go-to dessert recipe. I’ve already started to compile a collection (and gave it it’s own label of Baking Basics) that includes go-to recipes for Chocolate Chip Cookies, Brownies and Blondies. I wanted to add to that list of basics a recipe for both classic chocolate cake and yellow cake. Today I’m sharing the chocolate cake recipe. You might be confused because the picture is clearly of chocolate cupcakes. And you’re going to be even more confused when I tell you now that this recipe is much better suited for regular layered or sheet cake, and not cupcakes. The crumb is super light and airy and it just doesn’t lend itself to being a sturdy cupcake. It’s also perfect for a layer cake because it *doesn’t* dome up much, which is what you want when you’re stacking cakes but isn’t what you’re looking for when you make cupcakes. Are you sufficiently confused now? I can’t tell you why I decided that night to make cupcakes instead of pouring it into cake pans and making a regular cake. It probably had something to do with the mountain of boxes and missing kitchen supplies that were surrounding me at the time. After realizing how ridiculous it would look and sound to tell you it’s better suited for cake, I wanted to remake it and get new pictures. Alas, I ran out of time. Now it’s Valentines day, I am craving chocolate cake and it just feels like the right time to share it. 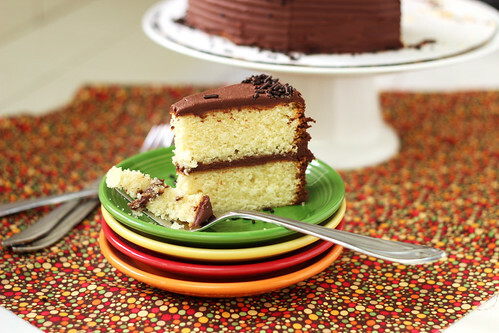 So again, this recipe makes a KILLER CHOCOLATE LAYER CAKE. The crumb is light and airy, but still rich and chocolatey. It uses regular all-purpose flour (which most everyone has on hand) and not cake flour which I look at as a bonus. It calls for coffee, but don’t be worried. It doesn’t taste like coffee it just enhances the chocolate flavor. 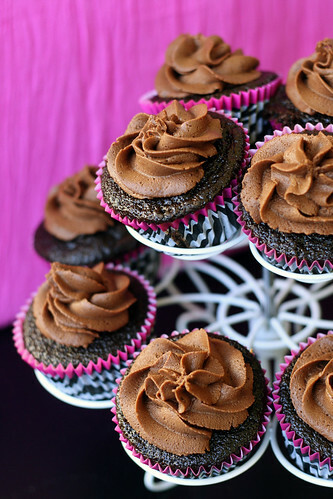 It can obviously be made into cupcakes, but, again, it’s better suited for CAKE. It’s one of those do what I say and not what I do things. And actually the cake tastes just as rich, moist and delicious in either form so it’s not like making the cupcakes would be wrong… Eek, I should stop before this turns into the worlds longest novel about cake vs. cupcake. In a glass measuring cup stir together the buttermilk, vegetable oil, eggs, and vanilla. Set aside. Sift together the flour, sugar, cocoa powder, baking soda, baking powder, and salt into the bowl of a standing mixer (fitted with the paddle attachment). With the mixer on low speed, slowly add the buttermilk mixture to the dry ingredients, mix until evenly combined. Scrape down the sides of the bowl and, with the mixer on low, add the hot coffee. Mix just until combined. Scrape down the sides of the bowl one more time. Evenly distribute the batter between the two cakes pans and bake for 35 to 40 minutes, or until a tester inserted into the middle of the cake comes out clean. Remove the cakes from the oven and set on a wire rack. Allow the cake to cool in the pans for 30 minutes, then flip out onto the wire racks. 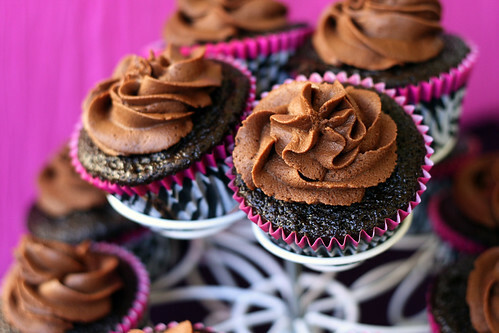 Frost with your favorite chocolate frosting. I’m one of those people that thinks it’s really fun to be in the kitchen all day, whipping up something fancy and delicious. I love desserts with multiple steps and ingredients, I can plan every detail out weeks in advance. Perfect example, my birthday cake. It required cake, chocolate ganache, vanilla bean mousse, and vanilla butter cream. And it was awesome. But I’m also one of those people that can be sitting on the couch and have an immediate urge to bake something. In those times I need something quick, reliable, delicious, and maybe even versatile. That’s why I think every baker, beginner, novice, advanced, whatever, should have a few basic go-to recipes. I think the staple “basic” recipes in baking are Chocolate Chip Cookies, Brownies, Blondies, and good Yellow and Chocolate Cake. I’ve already shared my go-to Chocolate Chip Cookies and Brownies, and thought that in the next few weeks (while I’m totally overwhelmed with packing, preparing, cleaning and looking for a good reason to procrastinate on those things) I’d share my baking go-tos. Because that’s the point of them, they’re not overly complicated, they don’t take a ton of time, and they’re still delicious. Good basics, that I can whip up while procrastinating packing. 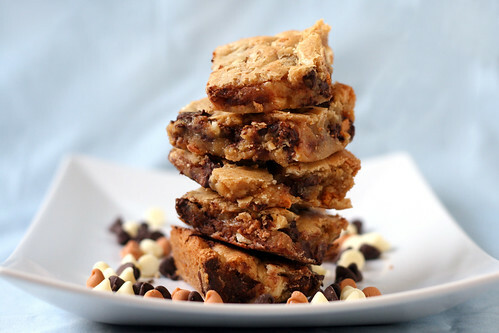 These Blondies can made in one bowl and are great jumping off point for pretty much any flavor combination. When I made these I had a handful of random chips that I threw in, butterscotch, white chocolate, and semi-sweet, but really the sky is the limit. Have left over Christmas or Halloween candy? Chop it up and throw it in. In the mood for nuts? Chop them up and throw them in. Go wild and get creative! 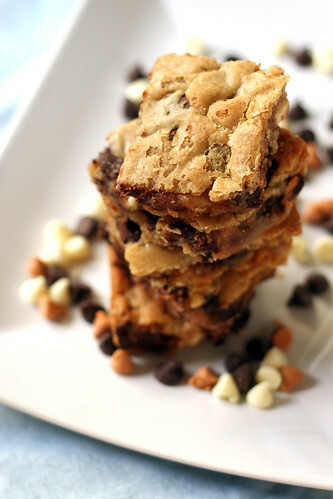 The only other thing I want to add is that I have a horrible habit of way under-cooking my Blondies. I usually take mine out a minute or two less than the written time because I like it when the center is barely done and gooey and messy. Before I was able to stack these for the picture I actually had to throw them in the fridge to firm up. If that’s not how you like them then don’t take them out early and make sure to test with a toothpick. If it comes out clean you should be good. If it looks wet or comes out with dough on it, let it cook a few minutes longer. Preheat oven to 350 degrees. Grease an 8×8 baking pan. In a large microwave safe bowl melt the butter in the microwave for 30 seconds. Add the brown sugar to the melted butter and stir to combine. Beat in egg and vanilla extract. Add 1 cup of flour, baking powder and salt and mix until combined. Toss the mix-ins with 1 Tbsp flour and fold into the batter. Pour into the prepared baking pan. Bake for 20-25 minutes, or until the center is set and a toothpick comes out clean. Allow to cool to room temperature before cutting into squares.